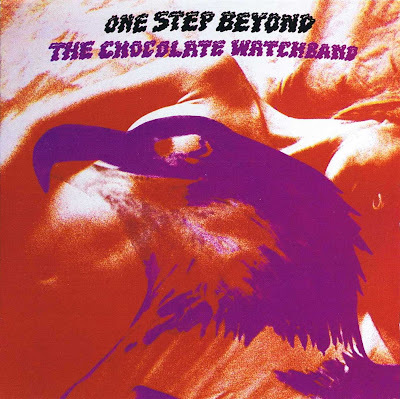 The third and final of the original studio albums by the Chocolate Watchband, One Step Beyond is a bit misleading and contradictory. On the one hand, it's as close as any performing group called the Chocolate Watchband ever got to making a finished album of their own, which is reflected in the fact that all but one song here was an original by the bandmembers; but on the other hand, this is a different Watchband lineup, assembled by Sean Tolby and Bill Flores, including guitarist Mark Loomis and drummer Gary Andrijasevich (both of whom had left in 1967 to join the Tingle Guild), and original, Foothill College-era Chocolate Watchband member Danny Phay (who'd also been in the Tingle Guild). Missing is David Aguilar, the band's one-time lead singer and most visible songwriter up to that time — and the result is an album that has almost none of the influence of the Rolling Stones, and, instead, shows the greatest folk-rock influence in their history. The overall sound is brittle but melodic, reminiscent in some ways of the Quicksilver Messenger Service, the Charlatans, Moby Grape, and the Jefferson Airplane. Danny Phay isn't nearly as charismatic a singer as Aguilar, but he's not bad, either, and there are lots of interesting shared vocals. There's also quite a bit more guitar noodling here than on any previous Watchband recording — that's not necessarily a bad thing, though it does dilute some of the impact of the punkier moments. "Devil's Motorcycle" is also of special interest to fans of Moby Grape, as it features the Grape's Jerry Miller subbing for Loomis on lead guitar. They shined on Ashford & Simpson's "I Don't Need No Doctor" as well as the Loomis/Andrijasevich original "Uncle Morris," and "Flowers" was a beautiful piece of folk-based psychedelia, while Sean Tolby's "Fireface" recaptured some of the original band's thicker rock textures. Original Foothill College-era member Ned Torney was also present on the sessions playing keyboards, but his work was left out of the final mix of the album, which meant the guitars got even greater exposure than intended. The overall album, which clocks in at well under 25 minutes, is an interesting and well-played coda to the band's history, but is also a long way from the sound of the group's earlier releases. Produced for compact disc by Bob Irwin. Mfd. under license from AVI Record Productions, Inc.